How long do you keep a bottle of vinegar? If it's more than a few months, there's no way you're using vinegar to its greatest potential. You won't believe how many uses there are for vinegar. 1. Kill bacteria in meat. 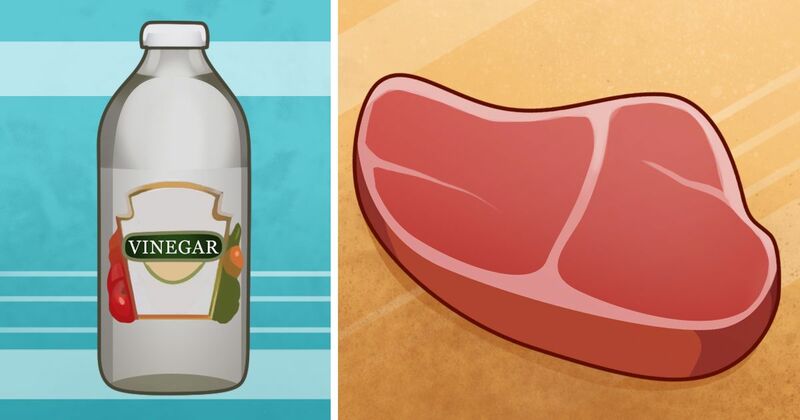 POPSUGAR advocates marinating meat in vinegar not only for the taste, but also for the disinfecting benefits. Vinegar slows the growth of listeria and makes the protein easier to digest. It also reduces the number of cancer-causing carcinogenics produced when the meat is grilled or cooked at high temperatures. 2. Wipe out mold. Rodale's Organic Life reports store-bought vinegar with 5 percent acetic acid is strong enough to kill mold. To get rid of mold, spray the problem spot with vinegar and allow it to dry. 3. Clean produce. Fruits and vegetables can harbor some nasty bacteria, including E. coli and Salmonella. That's why Rodale's Organic Life recommends spraying produce first with vinegar and then with hydrogen peroxide. Allow the produce to dry completely before eating. 4. Disinfect cutting boards. Rodale's Organic Life recommends cleaning wood cutting boards with a mixture made from either hydrogen peroxide and vinegar or salt and vinegar. This will reduce the risk of transferring dangerous food-borne bacteria to other kitchen surfaces. 5. Steam clean the microwave. You'll love this expert tip from Reader's Digest. Pour 1/4 cup vinegar and 1 cup water in a glass bowl. Place it in the microwave and heat on high for 5 minutes. Let the bowl cool, dip a cloth in the mixture, and wipe away stains. 6. Clean the refrigerator. Wipe the refrigerator, inside and out, with a solution made from equal parts water and white vinegar. Reader's Digest says this is an excellent method for disinfecting your refrigerator. 7. Refresh ice trays. Reader's Digest recommends soaking ice trays in undiluted vinegar for 4- 5 hours to remove hard water stains. Rinse the trays under cold water and allow to dry. 8. Clean the coffeemaker. Coffeemakers can get pretty gross. Give yours a reboot with a vinegar wash. Reader's Digest says to fill the decanter with 2 cups white vinegar and 1 cup water. Place a filter in the machine, pour the vinegar mixture into the water chamber, and then turn on the coffeemaker to allow it to run through a full brew cycle. When it's finished, remove the filter and replace it with a fresh one. Run clean water through the machine for two full cycles, replacing the filter after the first brew. 9. Clean a tea kettle. This method is less complicated than that for the coffeemaker. Reader's Digest recommends boiling 3 cups white vinegar in the kettle for 5 minutes. Leave the vinegar in the kettle overnight and rinse with cold water. It should be good as new. 10. Clean pots and pans. If your pots and pans are covered in gunk and grime, look no further than a bottle of vinegar. Mix equal parts salt and flour. Add vinegar until you achieve a paste-like consistency. Scrub using the paste and then rinse with warm water, as recommended by Reader's Digest. 11. Ban bugs. The pantry can be a nesting grounds for all sorts of creepy crawlers. If you have a bug problem, Reader's Digest recommends filling a small bowl with 1 1/2 cups apple cider vinegar and a few drops of liquid dish detergent. Leave the bowl for a week. Next time you look, you'll see all sorts of insects floating in your DIY trap. 12. Trap fruit flies. You've taken care of bugs in the pantry, but what about ever-annoying fruit flies? Follow the advice of Reader's Digest and fill a jar half full with apple cider vinegar. Cover with the original lid or plastic wrap and punch a few holes in the top. You'll be surprised how many fruit flies land straight in your trap. 13. Soothe sunburn. To relieve pain from a sunburn, treat the affected area with vinegar, as recommended by AOL. 14. Reduce age spots. Look years younger with this recommendation from AOL. Spread a mixture made from equal parts vinegar and onion juice on age spots. After several weeks, you may notice a difference. 15. Relieve itch. If you're plagued by a rash, treat yourself to a bath. AOL suggests adding apple cider vinegar to a warm bath to relieve body itches. Vinegar is also useful as a spot treatment against itchy bug bites. 16. Tone skin. Balance pH levels and prevent breakouts with a DIY toner made from equal parts vinegar and water, says AOL. 17. Longer nail polish. Extend the life of your nail polish with a nail soak made from 2 teaspoons vinegar and 1/2 cup warm water, says AOL. 18. Foot deodorizer. If you struggle with smelly feet, New Health Guide says to soak them in a foot bath made from 2 gallons warm water and 1 cup white vinegar. Soak for 45 minutes twice weekly to eliminate foot odor, treat athlete's foot, and kill fungus. 19. Soothe a sore throat. If you're battling a scratchy throat, drink 1 cup warm water mixed with 1 tablespoon apple cider vinegar, as recommended by Authority Nutrition. For extra relief, add 1 tablespoon honey. 20. Clean dentures. If you wear dentures, you'll be happy to learn vinegar is a wonderfully gentle disinfectant that effectively cleans dentures. Authority Nutrition says apple cider vinegar may be less harmful to your mouth than other cleaning agents. What's your favorite way to use vinegar? Tell us when you SHARE this article on social media!